Thi article was originally posted as February: A Busy Month for Upper West Restaurant on Huffington Post. Valentine’s day came and went with a flurry. As usual, the trendy Santa Monica restaurant Upper West catered to a sold out crowd on the most romantic night of the year. Next in line for Upper West is an opening reception for artist Brooke Harker on Sunday, February 21. Harker just returned from her second trip to Italy where her lively paintings were featured in two solo exhibitions. The latter took place in January 2016 at Satura Art Gallery in the old town district of Genoa, Italy. In 2015, she completed an artist residency on a farm in Italy (about an hour south of Rome) where she created the works for that collection. There she lived the artist dream, entrenched in Italian culture…painting and visiting historic landmarks. Harker, a Los Angeles based cityscape artist (known for capturing the energy of busy LA scenes as well as numerous cities around the world), gained this opportunity due to her ability to depict urban perspectives which transport viewers into the colorful worlds created on canvas. Harker revealed that one of the challenges she encountered in Italy which truly changed her as an artist, was that she had to re-adjust her work-to-life ratio. Italians are known for being relaxed, drinking wine, and enjoying social interactions in the middle of the day…that was a foreign concept for the hard working artist. “I really thought I would paint in Italy like I did in LA…with speed, force, and an unyielding pursuit of a goal. Instead, I encountered many people who were just sure that I couldn’t enjoy my life while working. I learned that Italians want everyone to enjoy their lives. After weeks of fighting it, I gave up and allowed myself to adapt to the culture. I agreed to embrace life differently. I took more breaks and soaked in the details… Perhaps that was an ironic and humbling shift for me.” One can only assume that this point hit home for the artist since her work spotlights the beauty of life’s details in the midst of an active scene. At Upper West, Harker will be showcasing various selections of her cityscapes, some of which caught the attention of Italian curator Alfio Borghese and landed her that opportunity to paint LA in Italy. This solo exhibition titled “Memoirs of Cities” will feature images from downtown LA to coastal areas such as Laguna Beach, Dana Point, Catalina, as well as some from San Francisco, New York City, and Tokyo. 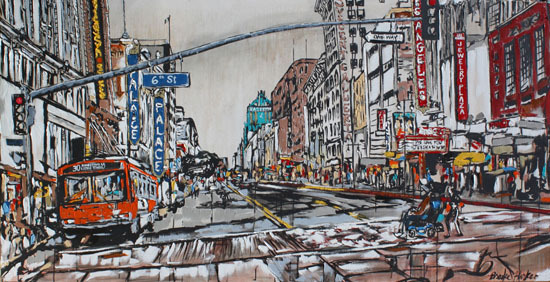 Harker’s vibrant depictions of gritty urban sprawl make for a lively and colorful exhibition adding to the ambiance and exquisite American fusion cuisine at Upper West. It was Fay’s idea to start the fundraiser three years ago. In 2011, at the age of twenty-three, she lost her Dad to acute myeloid leukemia. Since then she has helped to raise more than $100,000 for LLS to fund research, cures, and patient support programs. Last year, Lindsey Adelstein joined forces with her, and this year, Cameron Iverson has also joined the planning team. The viewing party begins at 4:30 pm (at the start of the red carpet event). 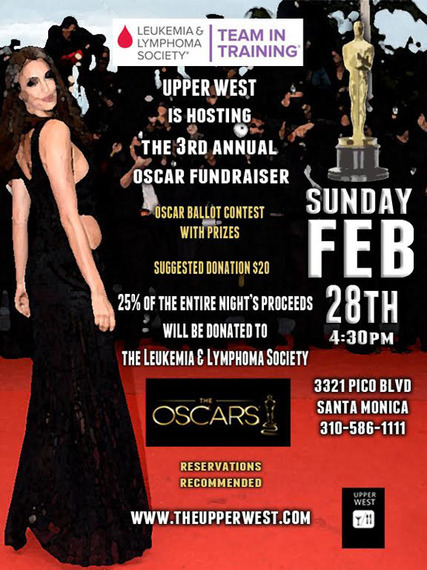 Attendees are encouraged to dress for the occasion and participate in the Oscar winner prediction challenge. Prizes and additional drawings will be part of the event. There is a suggested donation of $20. The full menu will be available. Upper West is located at 3321 Pico Blvd. in Santa Monica. For more information or to make reservations, call 310.586.1111 or visit TheUpperWest.com. To find out more about LLS, see LLS.org.